Like New 2016 Mazda6 i Touring Plus, One Owner, LEATHER, SUNROOF, NAVIGATION, REARVIEW CAMERA, Only 19k Miles, CARFAX/AUTOCHECK and STATE CERTIFIED with BUYBACK GUARANTEE, Automatic, BLINDSPOT MONITOR, KEYLESS ENTRY, Loaded w/Power options, BLUETOOTH, DUAL ZONE CLIMATE CONTROL, MP3/SATELITE RADIO COMPATIBLE, PREMIUM ALLOY WHEELS, STILL UNDER FULLY TRANSFERABLE FACTORY WARRANTY...The Mazda6 is a dynamic sweetheart that can dance step for step with a Honda Accord, and it is a bold design statement that eschews the timidity that still afflicts some of the segment’s major players. As Mazda’s second total-vehicle application of its Skyactiv Technology discipline, this Mazda 6 owes essentially nothing to its predecessor and a lot to the CX-5 crossover. The new look is guided by Mazda’s Kodo design language and was previewed by the dramatic Shinari concept sedan unveiled back at the 2010 New York auto show. As in the previous 6, the standard engine here is a 2.5-liter DOHC direct-injected 16-valve aluminum four. Also, Mazda’s i-ELOOP system is employing regenerative braking and capacitors to reduce the draw on the alternator and thus enhancing fuel economy. A member of the Skyactiv-G four-cylinder family, the new engine is a long-stroke design with variable valve timing, exceptionally high injection pressure (2900 psi, up from 1600), and a very high compression ratio (13:1), specifications that allow it to operate on regular unleaded fuel. Rated for 184 horsepower at 5700 rpm and 185 lb-ft of torque at 3250, its output is strong among competing fours, its EPA fuel-economy estimates—25 mpg city/37 highway with a six-speed manual transmission, 26/38 with a six-speed automatic—are pretty good for a non hybrid mid-size sedan. This Mazda6 rolls out as an attractive proposition, with snarky good looks, an attractive and roomy interior, plenty of equipment, a sweet six-speed gearbox, a smooth ride, quiet operation, and, the capper, eager responses. As with any other of our vehicles, you may have this one pre-inspected by your trusted mechanic prior to purchase. We strive to only keep high quality vehicles with low mileage offered at the most competitive price. We are a family run independent Dealership with over 30 years of experience serving families, and our low overhead translates to lower prices for our customers. Each of our pre-owned certified vehicles goes through a 108 point check and Virginia residents receive a brand new State Inspection. Visit us online at www.lynnhavenmotors.com to see more pictures of this vehicle, or call us at 757-425-9300 today to schedule your test drive. 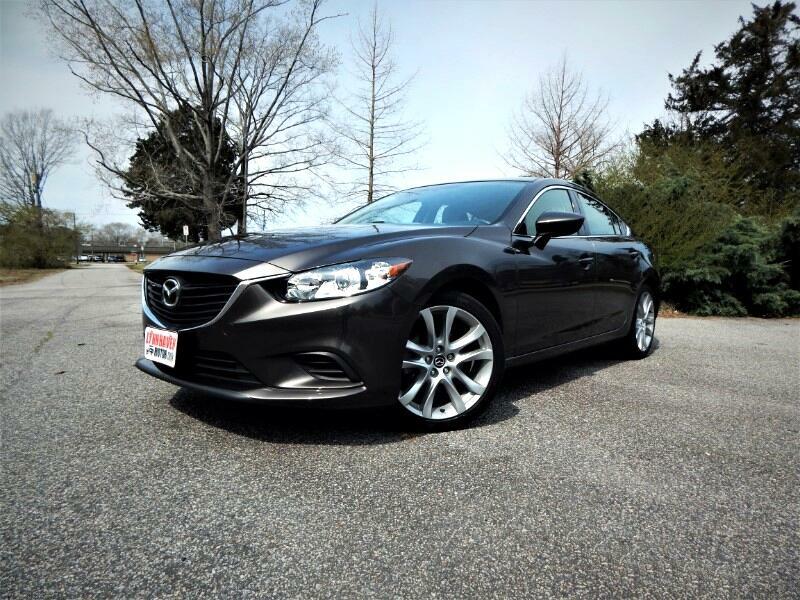 Vehicle Inquiry for 2016 Mazda MAZDA6 TouringPlus,Navigation,Sunroof,Leather Interior!